Yesterday started with another noodle soup. Pho is pretty much the national dish here in Vietnam and is a thin soup with flat rice noodles and fine sliced raw beef is added to the boiling broth on serving so is cooked as you get it. Herbs are added fresh. A substantial bowl of Pho costs around $2 NZ. Next we headed round the corner for a coffee which almost always comes very strong and sweetened but with extra sugar available should you want it. Mark has his cold with ice but my hot cup usually arrives in a bowl of boiling water, presumably to keep it warm. We next packed our bags and took a taxi to our new airbnb apartment on the 18th floor of a large residential block. We have plenty of room with two bedrooms and bathrooms and great views. 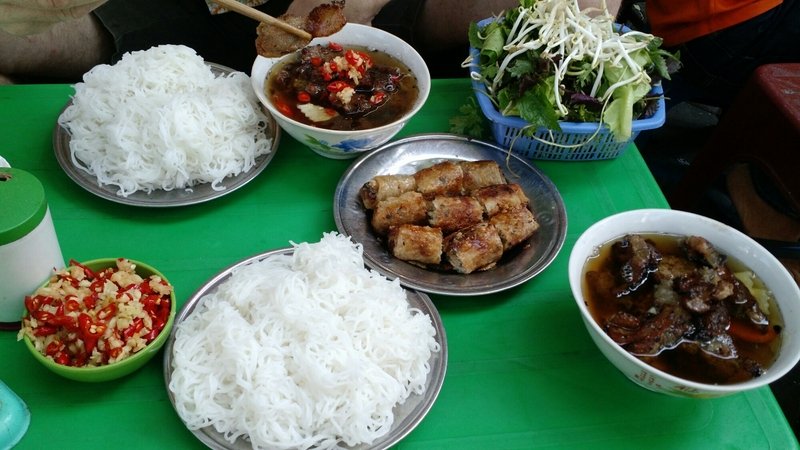 Lunch, again on the street and on low plastic stools, was Bun Cha and spring rolls (above), again ridiculously cheap but delicious. I think most kiwis would worry a bit about the hygiene standards of the street food but it is very popular with the locals and so far I have experienced no ill effects. Mark wanted to work in the afternoon so I walked to a beautiful park surrounding a lake (Ho Bay May) where people were fishing, playing games, exercising, doing tai chi and just sitting. One common game here is played on a court like badminton but the contestants kick a long shuttlecock back and forth over the net. Its a bit like hacky sac or volleyball because they can bounce the shuttle off their feet multiple times before returning it over the net. Very skillful! 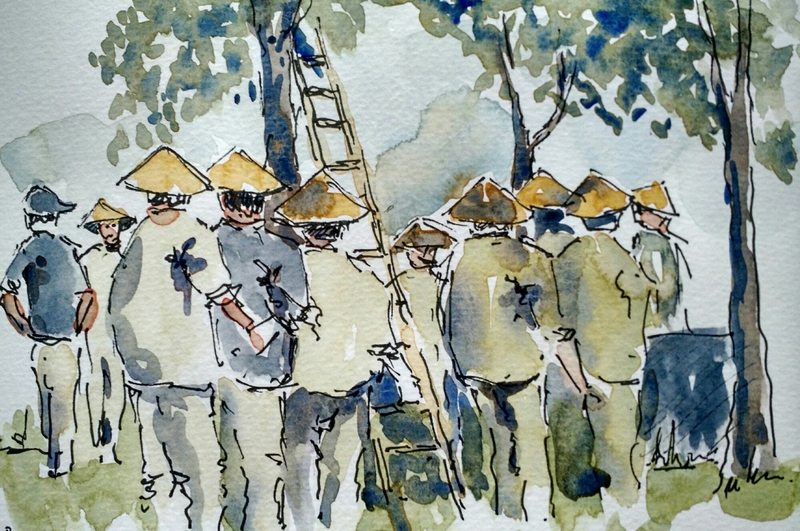 The sketch is of a large group of traditionally dressed park workers planting a large tree.